Nowadays, the human race is becoming more sensitive to the changes in the environment. This sensitivity may result in triggering a number of diseases, including Raynaud’s disease, which constitutes a change in the vascular functions of the human body. Conferring to the facts and figures of Raynaud, every 5 out of 100 Americans suffer from this disease. On the other hand, merely 1 out of 5 would pursue treatment. Raynaud's phenomenon most often affects women, rather than men, exclusively in the ages from 20 to 40. Raynaud's phenomenon can occur on its own or in relation to other medical conditions such as rheumatic diseases. Read on for an extensive explanation of Raynaud’s disease. Are you more of a visual learner? Check out our online video lectures and start your vascular medicine course now for free! Raynaud’s disease (also Raynaud, or Raynaud’s phenomenon) was first described in 1862 by Auguste Raynaud. Even at a first look, the disorder is apparent, owing to the fact that the patient notices the change in the color of their skin, particularly in their digits. At low temperatures, the skin becomes cold and pale due to abnormal vasoconstriction of the digital arterioles leading to diminished blood supply. This may result in the coldness and cyanosis of the digits as the distension of veins occurs, followed by the bluish skin coloration . With the rise of temperature, the skin turns warm and red as a result of the arterioles’ response to vasodilatation. Raynaud’s disease is an exaggerated vascular response to cold temperature or emotional stress. The phenomenon is manifested clinically by sharply demarcated color changes of the skin of the digits. Reduction in the size of the blood vessels, most commonly in the fingers and toes, results in change of color from white to blue. As blood flow returns to the digits, the skin turns red. Its affection is symmetrical, usually attacks in episodes, a clear demarcated line exists between ischemic part and unaffected part. Raynaud’s phenomenon is an ailment causing a specific sequence of color changes in the extremities in response to stress or weather fluctuations, either hot or cold. A great number of people with Raynaud’s disease have extreme sensitivity to cold temperature. Primary Raynaud phenomenon (RP) or idiopathic Raynaud disease are terms to describe those patients without a definable cause for their vascular events. In this setting, RP is considered to be an exaggeration of normal vasoconstriction to cold exposure. Secondary RP refers to those patients with RP in whom an associated disease or cause may underlie the attacks. Possible associations include atherosclerosis, scleroderma, lupus and rheumatoid arthritis. It can also be a result of taking assured medications, having frostbite, smoking or using vibrating power tools for numerous years. Therefore, it is sometimes referred to as secondary Raynaud’s. Secondary Raynaud’s is more frequent than idiopathic Raynaud disease. Also, it is more likely to occur in both genders with an almost equal distribution. The disorder progresses proportionally, affecting digits from both hands or feet in symmetrical manner. Over a period of time, recurrent and sustained spasms become more common. Color changes in your skin from white, blue to red, in response to cold or stress. Events are episodic. Swelling, numb feeling or stinging pain upon warming or stress relief. It can occur both in our lower and upper limbs as well as the chin, nose, lips and ears. In occasional situations, low oxygen supply can result in the occurrence of necrosis. The impacts are reversible, and they should be distinguished from the non-reversible origins of low blood supply, including thrombosis or vasculitis. 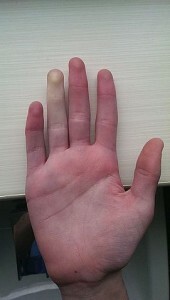 A deficit of vasodilators, mainly nitric oxide, has been suggested to be one of the cause of Raynaud’s phenomenon. Moreover, effective vasoconstrictors generally present in our endothelium (known as endothelin-1) have been observed to be flowing in elevated levels in people suffering from secondary Raynaud’s disease. Discharge of the vasoconstrictor endothelin-1 is elicited by stimuli of vasoactivation, including transforming growth factor beta (TGF-beta), vasopressin and angiotensin. Angiotensin has both pro-fibrotic and vasoconstrictive impacts. In people suffering from systemic sclerosis, fundamental anomalies allied with vasculature fibrotic proliferation result in decreased blood flow toward the digits. This is a usual characteristic difference from the primary Raynaud’s disease. Compromised vasodilation can also be part of Raynaud’s phenomenon. Calcitonin, an essential, gene-related neuropeptide,is released by nerves supplying the blood vessels. A lower amount of calcitonin-secreting neurons has been observed in a biopsy of skin samples of people suffering from systemic sclerosis and primary Raynaud. 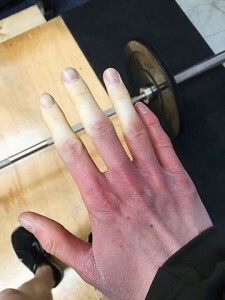 Abnormal vasoconstriction in Raynaud’s phenomenon can lead to increased activity of α2C-adrenoreceptors; vasoconstriction of the blood vessels has been known to be cold-induced by these adrenoreceptors. In systemic sclerosis and primary Raynaud, enhanced activation and accumulation of platelets has been revealed. An improved synthesis of thromboxane A2, which is actually a vasoconstrictor, has been observed in people with Raynaud’s phenomenon. Patients with systemic sclerosis have been observed to have a weakened fibrinolytic scheme, which might contribute to vessel obstruction. During an occurrence of Raynaud, the body withholds the flow of blood from the feet and hands, which causes them to feel numb and cold, thus turning them white or pallor. As the blood flow returns, and the digits of the toes and fingers become hot and warm, they begin to turn red. This is followed by pounding and pain. On occasion, Raynaud can also affect the ears or nose. The condition may manifest more frequently but last for short periods of time. Nevertheless, in some situations, it may occur for longer durations. The subsequent challenge is to discriminate among primary and secondary causes of the ailment. For this, the physician can take a sample of the patient’s skin from the base of a fingernail to inspect it underneath a compound microscope. This technique is known as capillaroscopy. The physician will look for inflamed or abnormal capillaries, which could be a signal of the secondary illness. A blood test might be essential, in order to see and examine the antinuclear antibodies and to assess the sedimentation rate of RBC’s. They both can expose problems related to autoimmune system or connective tissues disorders. MRI scan is suggested in some of the cases to detect and treat rheumatologic disorders that may be associated with Raynaud phenomenon. A treatment of Raynaud’s disease, to widen blood vessels and promote circulation, could be vasodilators, such as calcium channel blockers. These drugs have the effect to relax and open small blood vessels in the feet or hands, decreasing the severity and frequency of attacks in the most people that are affected. Sympathectomy is necessary when the illness obstructs the patient’s daily activities. Thoracic and cervical sympathectomy can give a short-term aid; on the other hand, lumbar sympathectomy is highly preferred as it gives an intense wide-ranging relief for a much longer duration. Prognosis is usually favorable with little morbidity and no mortality. In very rare situations, however, low oxygen supply in the affected part of the body can result in necrosis. The prognosis for patients suffering from secondary Raynaud’s phenomenon is closely correlated to the underlying cause and disease. The prognosis for the patient’s digits depends on the extremity of the low oxygen supply and the efficacy of management. 1. A 20-year-old woman complains about extreme sensitivity to the cold atmosphere with pallor color of the skin for few minutes. Capillaroscopy is showing inflamed vessels. What is the possible diagnosis? 2. A smoker suffering from rheumatoid arthritis complains of discoloration of the periphery of the digits. What could be the most likely diagnosis? 3. Which of the following are the diagnostic criteria for primary Raynaud’s? Wigley FM. Clinical practice. Raynaud’s Phenomenon. N Engl J Med 2002; 347:1001. Ling SM, Wigley FM. Raynaud’s phenomenon in older adults: diagnostic considerations and management. Drugs Aging 1999; 15:183. Maricq HR, Weinrich MC, Valter I, et al. Digital vascular responses to cooling in subjects with cold sensitivity, primary Raynaud’s phenomenon, or scleroderma spectrum disorders. J Rheumatol 1996; 23:2068. Murray AK, Moore TL, Manning JB, et al. Noninvasive imaging techniques in the assessment of scleroderma spectrum disorders. Arthritis Rheum 2009; 61:1103. Maricq HR, Jennings JR, Valter I, et al. 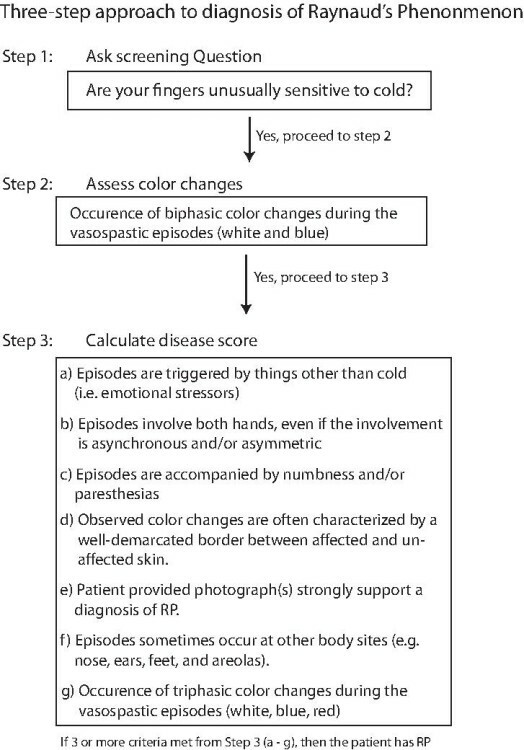 Evaluation of treatment efficacy of Raynaud phenomenon by digital blood pressure response to cooling. Raynaud’s Treatment Study Investigators. Vasc Med 2000; 5:135. Thanks you for this lessons. Enjoyed this article but curious, how will the changes in skin color appear in less fair skinned people? Also, how do the statistics look among race/ethnic groups? Thank you for this lesson.